BOWIE, Md. (WUSA9) -- An investigation is underway into a late night house fire in Bowie that has left one man dead. Assistant Fire Chief Paul Gomez, spokesman for the Prince George's County Fire Department, says crews were called to the 6400 block of Grendel Place around 10:17 Wednesday night for a report of a house fire. Firefighters were met with massive flames on multiple floors of a single family home. According to Assistant Chief Gomez, crews were forced to evacuate the house when the extreme heat caused stored ammunition to explode. He says the ammunition is not connected to the victim's death. The man's body was found on the second floor of the structure, says Gomez. It appears no one else was at home at the time of the incident. The victim's identity will not be released until next of kin can be notified. BOWIE, Md. (WUSA9) -- Prince George's County police need your help identifying a suspect wanted for a bank robbery in Bowie. Shortly after noon on May 23, the suspect walked into a bank in the 4300 block of Collington Road, approached a teller and demanded cash after implying he had a weapon. The teller complied and the suspect got away with an undisclosed amount of money. Police say they believe the suspect is a man dressed as a woman. BOWIE, Md. 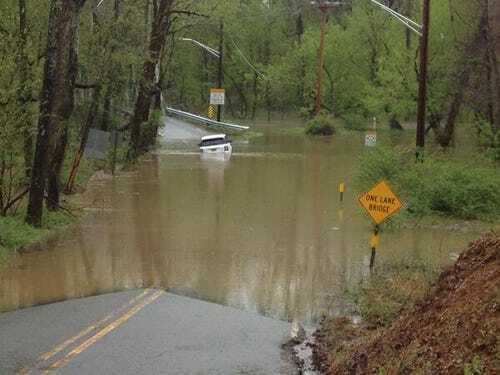 (WUSA9) -- One person has been rescued by Prince George's County Fire and Rescue crews after being trapped on a flooded road. The rescue happened on Governor's Bridge Road where a Range Rover was stuck in the water. One person was inside the vehicle. Streets across the DC area are flooded and closed. Please drive with caution and turn around. Do not attempt to cross a flooded street or road.